As I wrote in an article back in April 2016, one of the world’s smallest and poorest countries, Rwanda, was testing drone deliveries, and that if successful it would make Rwanda a world leader in using drone technology. Well, last week Rwanda launched the world’s first commercial drone delivery service. The drones being used are U.S. based Zipline drones, a fixed wing aircraft that is launched via catapult. The Ziplines are autonomous and fly using satellite navigation. The drones are powered by battery, have a top speed of 60 mph, and a range of over 150 miles. For this project the drones missions will be within a 93 mile radius of the base. Once they reach their destination, they do not land but drop their cargo via parachute before returning to base. 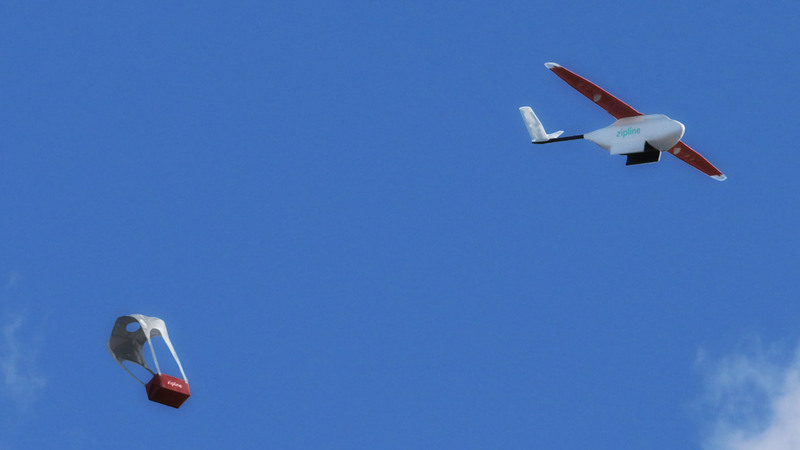 The drones are being used for delivering blood, plasma and coagulants to 20 hospitals and clinics in the rural western part of Rwanda. A health worker can place an order by text message. Within minutes, a Zip [drone] is prepared and launched into the sky. Racing along at 100 km/h, Zip arrives faster than any other mode of transport, no pilot required. The medical products are then dropped off, landing gently and accurately at the health facility in an open area the size of a few parking spaces. eLMIS provides real time data on pharmaceuticals and other medical commodities in the supply chain, and tracks their flow from distribution centers dotted around the country to hospitals, clinics and ultimately to the patients. The system also tracks expiration dates, so that older medicines can be prioritized and consumed so there’s less waste. You can learn more about the Rwandan pharmaceutical healthcare network here.